What do you get when you add red carpet, beautiful gowns, handsome suits, gold trophies, and lots of gossip? The Oscars!!! Being invited to my neighbor’s house each year to watch the Oscars is always a treat. She always has beautiful table with great snacks to munch on while we watch, in anticipation, who is going to win best actor, best actress, and best movie. I must admit though, my favorite part of this years Oscars was Adele and Barbara Streisand. I love hearing them sing. 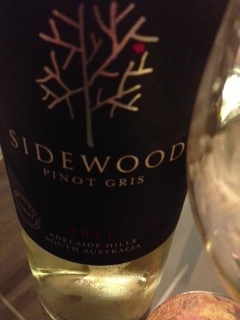 This Pinot Gris was a light straw color in my glass and had beautiful aromas. Floral notes with apple and pear with a hint of minerality. The tasting notes on the WTSO said that it had a hint of oak on the nose and palate. I did not get any oak on this wine. The palate had nice complex layers of light and refreshing citrus, pear, and apple. The acidity was nicely balanced. This wine left me wanting more…good thing I have two more bottles. A lovely evening with friends…great food, a very nice wine, Barbara Streisand and Adele…what more could I ask for?